ABS Spacers | Boker's, Inc.
Boker's is a stamping manufacturer of ABS spacers. Acrylonitrile Butadiene Styrene, or ABS, is a common material used to make light, rigid products. 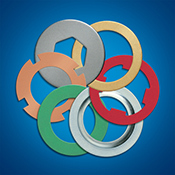 Boker’s provides ABS spacers in a variety of shapes and sizes up to 5” x 7” (flat) with thicknesses from .005” to .125”. ABS spacers are often used to achieve precise spacing between components and/or materials. To obtain a quote for abs spacers fill out Boker’s fast quote form and submit applicable production prints. Note, the inside diameter noted may shrink by as much as 10% of the material thickness depending on the material used and its thickness. If no tool is available within your specified tolerance range Boker's can have a custom metal stamping die manufactured in just a few hours. For custom orders fill out the fast quote form. Please refer to Boker's non-metallic shrinkage factors. Search below to identify tools in stock available for manufacturing flat round ABS spacers in any quantity without a tooling charge. You can choose an exact thickness for precision ABS spacers within the tool range indicated. If no tool is available within your specified tolerance range Boker's can have a custom die manufactured in just a few hours. For custom orders fill out the fast quote form.